There are many ways to get the most from your own kitchen equipment depending on what you have and how you use it. We're all different but there are some handy pointers I can share with you that might help you to get more from what you have and the way you use it. 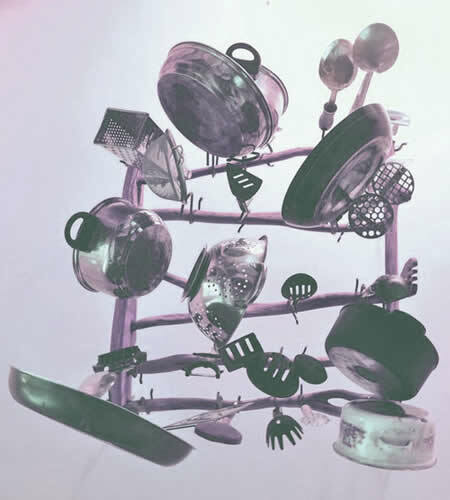 Welcome back again to this great site, where we'll start looking at how the main items of cooking utensils are used in many kitchens up and down the country and take a general look at why they are used and in what context. A conscientious cook would tend to care a great deal about the quality of the pots and pans they have in their kitchen. I believe my own experience with the stainless steel cookware set I own has some bearing on the way I do things today. Let's take an overview look at This. I don't want to start by giving you a bunch of great tips on how to improve the way you do things in your own kitchen. Instead, I'd like to start at the end, which is the part where you clean up after you've used everything! Why would I do that? Well, from my own perspective, I like to start a cooking session with all my utensils, appliances and equipment looking clean and shiny and ready for the work they will be doing. For that to happen, I would have had to have made sure I cleaned everything up properly the last time I used it. I hope that doesn't sound too backwards for you, but what I'm trying to say here is that when you put stuff away clean, it comes out ready to use. There have been enough times in the past when I have shared a kitchen and the last person to use all the gear didn't clean it properly and put it all away in a slapdash way. That's fine if that person was the only one to use the kitchen, because they could be happy wallowing in their own mess! But I like to work to a pretty regular methodology. I really appreciate opening a cupboard and being able to put my hand on exactly the item of equipment I need (because I put it there last so I know exactly where it is). I also appreciate being able to open a pot to see it gleaming clean on the inside as well as on the outside, because I took the time to give it a really thorough clean the last time I used it! These are not nit-picking or finicky rules an old fusspot would live by, but simple common sense that anyone who follows will appreciate the natural sensibility of! I admit it, I am a fairly methodical person when it comes to preparing a meal. I like an orderly kitchen where I know the location of everything I need and items I use frequently are stored in a place that is readily at-hand so I don't have to waste time hunting around for them. So there's your first working tip right there. Don't waste time searching for things because you were too lazy to put them away in the right place! be orderly and methodical in your work and you will be rewarded by having more time to get things just the way you want them without getting stressed because you are rushed! Another really useful tip I can offer that has always done me a great service is to only use those items of equipment that you really need. And don't go using every pot and pan in the kitchen to create a meal unless it is absolutely necessary. Why? Well, since it is usually me that cleans up after I cook (because I can trust myself to clean up properly--see my first point) and I know that I will put things away in the right places (second point), it makes sense to not have to go cleaning up a huge pile of cooking utensils when I can get away with using fewer and thereby having fewer to clean up after! Yes, it does make good horse-sense, doesn't it! Of course, if you are able to trust your precious stuff to someone else to clean up and put away, then you are a lucky person. It's rare to find someone who thinks along the same lines as me, so I know it would be pretty difficult for you too. By way of an example, if you're boiling potatoes then steaming vegetables, boil the potatoes first, remove them and store in a bowl for later, then steam the veggies altogether in the same pot! If you're frying, just use the one pan if you can get away with it. It's simple really, but when it comes to clean up time, you'll be glad you were economical with the hardware! Another useful tip is to try and conserve your cooking fuel where possible, because you can if you know how. It will add up over the course of a week, a month and a year in lower fuel bills! As an example, when I'm boiling pasta, once the water has reached the boil, I reduce the heat and simmer. I know a lot of recipe books tell you to keep the pasta at a rolling boil, but it really isn't necessary. Also, I use less cooking time than it says on the packet to get a slightly firmer result that doesn't stick. My pasta comes out just fine that way. Same with rice. I use different kinds depending on the dish. For regular long grain or Basmati rice, I bring to the boil then reduce the heat to simmer for about 5-6 minutes rather than the 10 or so minutes as often recommended. I drain and fluff with a fork then leave to sit for a minute or two before serving and my rice is always perfect and never sticks! OK. that's enough for one post on an old doctor's home cookery tips. Yes, I know I said in the last post that I'd start looking at individual items in more detail, and I will in future posts, but for the first few, I want to generalize as much as possible so the reader has a better overview before I start getting more focused.